Kabuki is a highly stylized traditional Japanese play performed to the accompaniment of song and music. The word Kabuki comes from an obsolete verb “kabuku” meaning “to be playful.” Its origin dates back to the beginning of the 17th century when a female Kyoto dancer called O-kuni used to perform a unique dance. It has been a form of entertainment for the masses since its beginning and boasts a large of supporters even today. 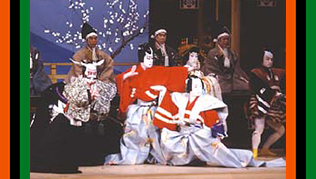 The characteristics of Kabuki are the combination of rhythmical words, unique dancing, gorgeous costumes and elaborate stage settings, colorful make-up, and music played on traditional musical instruments including shamisen. It does not emphasize realism, but has its own unique formalities. As there are no actresses, the female roles are played by male actors known as Oyama helping create a very special atmosphere peculiar to the Kabuki world. What are special to Kabuki stage are the Mawaributai (revolving stage), the Hanamichi (an elevated passageway), and the Seri (movable platform). 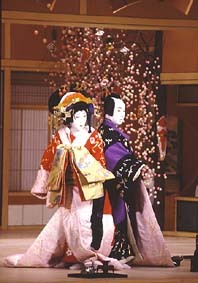 Kabuki are either about the everyday life of the common people or about the fortunes of the noble and warrior classes. Kabuki acting art is passed on from father to son and they are trained severely from very early childhood. Kabuki names are also hereditary. For example, Ichikawa Ebizo XI, the most popular actor, took over his current name from his own father Ichikawa Danjuro in 2004.